Get this festive nail art look using CND Shellac. 1. Prep the natural nail. 2. Apply a thin layer of CND Shellac Base Coat and cure for 10 seconds in the CND UV Lamp. 3. Apply a thin layer of CND Shellac Cerulean Sea in a half-moon pattern. Cure for two minutes. 4. Use the tip of the Gel Flat Oval Brush to apply a skinny line of CND Shellac Sultry Sunset next to the Cerulean Sea. Cure for two minutes. 5. Use the tip of the Gel Flat Oval Brush to apply a skinny line of CND Shellac Bicycle Yellow next to Sultry Sunset. Cure for two minutes. 6. Apply a thin layer of CND Shellac Electric Orange to the rest of the nail. Cure for two minutes. 7. Dip the tip of a dry Gel Flat Oval Brush into Additives Pink Lotus and apply to the cured Sultry Sunset. 8. 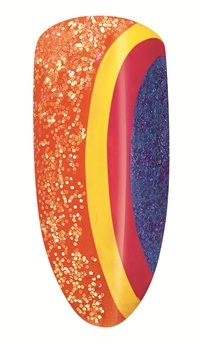 Dip the tip of a dry Gel Flat Oval Brush into Additives Sizzling Sand and burnish into the entire nail. 9. Apply a thin layer of CND Shellac Top Coat and cure for two minutes. 10. Wipe with 99% Isopropyl Alcohol to remove top film.